So great a need for new beginnings in the world also produces an urge to find shortcuts. Funding from the Chinese state, the enemy of the workers and masses of that country and therefore the enemy of workers globally, is trickling into the academic Left but is a shortcut to nowhere. So are the simple formulas of the fossilized portion of the supposedly revolutionary Left that reduces everything to opposition to U.S. imperialism. They are busy defending Russia’s decidedly anti-revolutionary Vladimir Putin, who is so admired by the Right, from Donald Trump to the many fascist groups Putin funds in Europe. Yet what of others on the Left who don’t know how to separate themselves from these anti-revolutionary tendencies, or don’t see the urgency, revealing their lack of a philosophical rudder and their lack of articulation of what they are for? More to the point are actual Left movements, like the social movements that have been sweeping across Latin America for over a decade. The activity of those movements enabled Left governments to take office, like those of Hugo Chavez in Venezuela, Evo Morales in Bolivia, and the Workers Party in Brazil. All have revealed grave contradictions, coming into conflict with those social movements that were not co-opted. The sharp electoral gains by the Right in Argentina and Venezuela, the implosion of Brazil’s Workers Party (see “Brazil meltdown opens a door to Right”), and the defeat of Bolivia’s referendum that would have allowed Evo Morales to run for another presidential term—all reveal the separation of these Left governments from the masses. Yet much of today’s Left disregards, excuses, or explains away their contradictions, as they grasp at one straw after another looking for models. All that does is evade the need for philosophy, without which the contradictions cannot fully be confronted, and thereby shift all responsibility onto the movement from practice, if not to parties that retain a large dose of vanguardism rather than embracing philosophy of liberation as leadership. As if any confirmation were needed, those who sang the praises of Syriza’s anti-capitalist challenge to economic austerity in Greece just over a year ago have little of depth to say about why the party transformed into the instrument of that austerity. Rather, they continue to champion an indiscriminate broad Left unity without explaining how it would end up differently. With greater promise, the autonomous Kurdish region of Rojava is at its best trying to work out a new path to liberation. However, as shown in Part IV, Rojava also suffers contradictions including ambivalence toward the revolution in Syria. 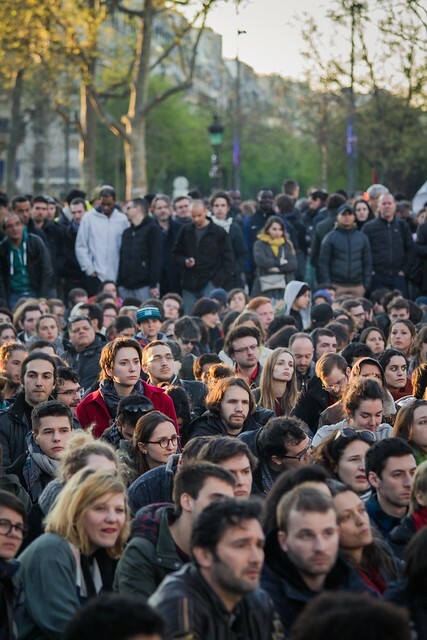 Nuit Debout general assembly at the place de la République, Paris, France, April 18. Photo by Kwikwaju, https://www.flickr.com/photos/86897692@N02/26446663321/. Nor can we find a solution by substituting horizontalism or similar approaches to non-hierarchical, directly democratic forms of organization in place of theory, let alone philosophy. History shows, in fact, that movements from below have, again and again, spontaneously created forms of organization as organs of revolt. These organs of self-determination reach for new human relations, including a more actual democracy than is allowed to function in existing political systems—and they spontaneously search for theory. Egypt’s experience shows an example of how tendencies are always present to provide a theory that falls short of what is implicit in the spontaneous forms. What won out were tendencies arguing that political democracy had been achieved in the shape of promised elections, which superseded the organizational forms involved in the occupation of spaces like Tahrir Square in Cairo as well as in the self-defense of neighborhoods and workplace struggles. That opened the door to counter-revolution’s assault and its military coup birthed in a bloodbath. At the same time, the passion for philosophy has grown out of the movements and especially out of their defeats, as N&L has shown in particular in Syria.1See “The Syrian Revolution and its philosophy,” Nov.-Dec. 2014 N&L. Together with the depths of counter-revolution, the passion for philosophy points to both the need for and the potential for totally new beginnings in the transformation of society. It points to the need for new banners of freedom as a polarizing force. Their absence has very serious consequences, especially when counter-revolution is so strong, so vicious, coming from so many directions, including from within the oppositional movements themselves. It therefore challenges us to make new Marxist-Humanist organizational beginnings. To achieve truly new beginnings, rather than simply a new stage of revolt, we must, as Marxist-Humanism has always stressed, begin from the Absolute instead of only from the immediate situation. That includes, but is not limited to, the need to demonstrate that total freedom requires putting an end to the division between mental and manual labor, in organization as in society, in theory as in practice. As we put it in our Call for last year’s national gathering: What is needed from an organization of the type of a small group like us is what Raya Dunayevskaya described as “leadership, not as ‘party to lead’ but as revolutionary philosophy to raise new banners of freedom that meet the challenge of the movement from practice.” In bringing together members and invited co-thinkers and co-activists, this year’s national gathering will aim (to paraphrase her) to collectively work out our Marxist-Humanist perspectives in such a way that analysis of the meaning of events and activity in mass movements lead to organizational growth as well as the self-development of masses as Reason as well as Force. This raises the need to intervene in all the movements and project philosophy as a force of revolution, as Dunayevskaya often put it. We have a solid foundation to build on in the body of ideas that she developed. We have a new entry into that body of ideas: the Archives that our organization made available online, which we have only begun to use. The Raya Dunayevskaya Collection, “Marxist-Humanism: A Half-Century of Its World Development,” and its Supplement, together with all issues of N&L from the beginning, which are also now online, our books and the other publications we have always made available, represent a living body of ideas that speak to the current world situation and provide the missing ingredient needed for truly new beginnings that would determine the end—but we have to project them concretely to make it so. That includes our work on the new books we will issue based on the Archives. Next year, on the 100th anniversary of the Russian Revolution, we will publish Russia: From Proletarian Revolution to State-Capitalist Counter-Revolution; and in 2018, the 200th anniversary of Karl Marx’s birth, we will publish Marx at Two Hundred: The Meaning of His Philosophy of Revolution in Permanence for Our Day. Both books will include previously unpublished writings and will provide new vantage points on the dialectics of organization and philosophy, in addition to illuminating revolution in permanence as central to Marx’s whole body of thought and as relating to the dialectic of revolution and counter-revolution in Russia. There is no substitute for the way Marxist-Humanism’s vantage point brings out the todayness of both Marx’s body of ideas and the historical significance of the Russian Revolution. In the wake of the betrayal of the Spanish Revolution from within and Stalin’s non-aggression treaty with Hitler, Dunayevskaya began by working out the concept of state-capitalism. The Archives illuminate how she was compelled to reach further for a new philosophical basis for the Marxist movement, delving into Marx’s Humanism and dialectic and its roots in the Hegelian dialectic. That culminated in “the philosophic moment,” when her breakthrough on Hegel’s Absolutes revealed the movement from practice as well as from theory. The first Marxist-Humanist book, Marxism and Freedom, showed how that movement from practice that is a form of theory was the driving force for development of theory in Marx’s age and our own “age of absolutes”—from the U.S. Abolitionist movement and the Paris Commune to the struggles against automation and for Black freedom at the time of the book’s writing. The second book articulated the integrality of Philosophy and Revolution, and with it the new category of Absolute Idea as New Beginning. This cast new light both on revolutionary leaders and alternatives and on the “new passions and new forces” of the day, as it ranged from Hegel’s dialectic in and for itself to the African revolutions, East European revolts and Black liberation and other 1960s movements in the West. The online availability of thousands of Marxist-Humanist documents gives us a new opportunity to work out a dialectic of organization and philosophy, a task of objective-subjective significance for the revolutionary movement worldwide. None can know exactly what would have been in the projected book, which Dunayevskaya did not write before her untimely death. The hundreds of pages of work she did toward it make clear that it cannot be reduced to one or a few observations, no matter how important. One key idea is that the forms of organization created spontaneously by masses in motion, which were to be central to the book, are the opposite of the vanguard party, but not the absolute opposite. The absolute opposite is philosophy of revolution, and that needs to be worked out organizationally. A crucial part of the test is to work it out concretely enough to result in organizational growth. The recent inreach to us shows the tip of the iceberg of the passion for philosophy and the search that is going on for what that body of ideas represents. The inreach includes not only the essay written unsolicited for N&L relating Black Lives Matter to Marx’s Humanism and Frantz Fanon’s thought, but two projects in Europe to publish new international editions of Marxism and Freedom, from 1776 until Today and Indignant Heart: A Black Worker’s Journal. It includes the letters we constantly receive from prisoners reporting on the conditions they experience and their reactions to theoretical articles, and stating that to know the truth of what is happening in the world they depend on N&L, the only newspaper whose mission is a concept and practice of presenting voices from below speaking for themselves in the context of the articulation of a philosophy of revolution. Inreach shows us the potential for organizational growth but cannot substitute for it. We have to confront the critical moment we are in not only objectively but organizationally. We need, the world needs, a new generation of Marxist-Humanists to be a part of the new generation of revolutionaries. Projection is of the essence. Projection to individuals, one on one, where there is the potential for developing the relationship to that individual taking responsibility for Marxist-Humanism, cannot take second place to any other activity, however crucial, from the study and inwardization of philosophy to dialogue and debate with other tendencies, to making political analyses and writing for and distributing the newspaper. We are at a moment when we strive to unify those crucial activities with that specific kind of projection, just as we strive for the unity of theory and practice. Thus we strive to concretize the dialectics of organization and philosophy as theory, as everyday practice, and as the organization of Marxist-Humanism, News and Letters Committees. In these times when the very survival of civilization is at stake, what comes to the fore is the urgency of warding off climate chaos; abolishing sexism, racism, heterosexism, class divisions, and war; and establishing new human relations as the very foundation of society. 1. ↑ See “The Syrian Revolution and its philosophy,” Nov.-Dec. 2014 N&L. This entry was posted in Articles and tagged Arab spring, Argentina, Bolivia, Brazil, China, counter-revolutionary anti-imperialism, Dialectics of Organization and Philosophy, Donald Trump, Egypt, Evo Morales, forms of self-organization, horizontal forms of organization, Hugo Chavez, Indignant Heart: A Black Worker's Journal, Joseph Stalin, Marxism and Freedom: From 1776 Until Today, Marxist-Humanism: A Half-Century of Its World Development, movement from practice that is itself a form of theory, neo-fascism, News and Letters Committees, Philosophy and Revolution: From Hegel to Sartre and from Marx to Mao, philosophy of revolution, post-Marx Marxism, prisoners, Raya Dunayevskaya, revolution in permanence, Rojava, Rosa Luxemburg Women's Liberation and Marx's Philosophy of Revolution, Russia, Russian Revolution of 1917, self-activity, self-determination, Spanish Revolution, Syrian revolution, Tahrir Square, The Philosophic Moment of Marxist-Humanism, vanguardism, Venezuela, Vladimir Putin. Bookmark the permalink.